Please use the form on the AVAILABILITY & PRICES page, there you can check availability prices or book your stay now without waiting for a reply. If you have any problems with this please just e-mail us at bookings@homefarmradnage.co.uk. with as many details as possible, please note you will then be asked to book online. Sorry but we are unable to take telephone bookings at the present time. An e-mail often receives a faster response. From the M40 junction 5 Take the A40 south east towards Stokenchurch. 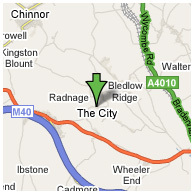 In 1 mile turn left at signpost Radnage. Site entrance on left immediately before the Crown Public House. There are no campsite signs just the “Home Farm” Sign.